By writer and historian Lynette Silver, project co-ordinator. A private project, to make and install stained glass windows in the historic church of St Michael and All Angels in Sandakan, Borneo (Sabah) has been completed. The world class, heritage windows are a memorial to Australian and British prisoners of war who died in Sabah - at Sandakan, Ranau or on the death marches - during 1942-1945, and a thanksgiving to the local people who risked, and gave, their lives to help them. A total of 2428 POWs (of whom 1787 were Australian) died at Sandakan or on one of the infamous death marches to Ranau, the bulk of them in 1945, sixty years ago. Only six Australians who escaped, survived. All 641 British POWs perished. This the first time Australians from all states have had the opportunity to participate in such a project or to show their gratitude to the people of Sabah, many of whom were tortured or imprisoned for trying to help the prisoners. Eight were executed by firing squad. How many others died is impossible to assess. Many of the prisoners, who were transferred from Singapore by ship, spent the night in the church before marching to the Sandakan compound, 12 kilometres away. Built in the late 1890s from local stone, in the style of a cathedral, St Michael’s is one of only four buildings to survive World War II. All, interestingly, were places of worship - two small Chinese temples, and the town mosque. 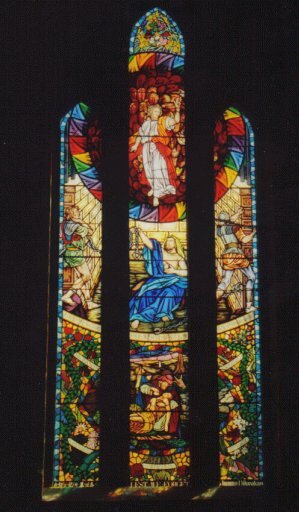 The idea to create a memorial window was conceived in 2003, during a trip to Sandakan, where I conducted an Anzac Day service with a small group of POW relatives each year. I approached the Rector to discuss my idea and, as a result, the church authorities made available the entire, tri-panelled west window. Over five metres in height, it dominates the main entrance. Response to the project from relatives of the prisoners and other caring people was so great (over $100,000 donated) that it was possible to commission the west window, and three more below, and to create a beautiful POW Chapel in the church. Philip Handel, a well-known Sydney artisan who has spent a life-time designing and making stained glass windows for gothic-style churches, came out of retirement to undertake the project. He used only hand-blown, antique French glass of the highest quality, and which he had not see in Australia for twenty years. Using this exquisite glass as his basis, he then began creating his masterpiece. Coincidentally, the main window consists of 2,500 pieces - one piece for each POW. Each piece of glass, after Handel had added the detail he required to create his design, was fired in a special kiln, up to three times, depending on the depth of detail required. The design of all four windows is integrated. The main window is spread across the three panels, or lights. Various shades of blue on the outer border represent the oceans which link the three nations. The subject for the upper, or memorial section, is from the Acts of the Apostles, Chapter 12, depicting a shining angel backed by ruby-coloured, spiralling shapes suggesting movement, and enclosed by a rainbow-hued circle – a symbol of peace and hope for the future. Below, in a prison cell, sits St Peter, who is under sentence of death. He is amazed at the awesome sight and incredulous at the miraculous loosening of his chains, and his subsequent deliverance which the Roman guards are unable to prevent. This scene is a reminder of the Almighty’s power to free the spirit of mankind from evil and oppression. The text, ‘By the strength of your arm, preserve those condemned to die’, reinforces this message. The lower section of the window features the well-known parable, The Good Samaritan. This story, which teaches compassion between strangers, typifies the spirit of mate-ship which sustained the prisoners until the end, and exemplifies the compassion of local people towards strangers in need of help and comfort during many dark days. Included in this setting is a representation of The Big Tree - a mengarris and a prominent landmark at the infamous Sandakan POW Camp. Another coloured spectrum, echoing the rainbow theme, frames the figures and the whole picture is encompassed with the flowers of Australia, Britain and Sabah, united by their wartime experience. The focus words Endurance, Honour, Compassion, Courage and Sacrifice, describe the triumph of the spirit and will over flesh – the purpose of the memorial. Below the main window are a large arched window over the west door, featuring a brilliantly coloured Christian cross, and two much smaller windows to either side – an angel representing Peace and another representing Eternity. The centre piece of the chapel, directly below the main window and incorporating the small angel windows, is a finely crafted, altar-like Table of Honour, with polished granite top, on which are inscribed the words ‘For there are deeds that should not pass away, And names that must not be forgotten.’ Over the granite is a glass case, containing the Roll of Honour, inscribed with the names of all our POWs, and local people who died or helped, and the Book of Special Remembrance, containing the names of all donors, along with the names of people they are jointly or individually honouring, and any special inscription. The books, hand-bound in burgundy, Moroccan leather and hand-tooled in gold, are composed of archival parchment guaranteed to last 500 years. Each week, a new page will be turned. Resting on the blank left-hand page of each book, as a paperweight, is a life-size pewter gum leaf, with a cluster of gum nuts. Around the walls of the chapel are regimental plaques, donated by associations and individuals and a hand-made pulpit banner, donated by the family of Padre Mcliver, an Australian army officer, who used it at his services, following the liberation of Borneo in 1945, and which we had framed. The breathtakingly beautiful windows and the chapel were dedicated at 4 pm on Anzac Eve. The 130 Australians and four British present, along with 50 family members of local people being honoured, knew they were about to witness something very special when the opening notes of the Trumpet Voluntary heralded a grand procession of a forty-voice choir dressed in brand-new robes, colour parties carrying the flags of Australia, Britain, Sabah and Malaysia (the Australian flag escorted by an Australian soldier whose grandfather had died at Sandakan) and senior Anglican clergy, headed by the Archbishop of South-East Asia Province, Datuk Yong Ping Chung, all clad in gorgeous cream, gold and red regalia. The four windows, draped in burgundy silk shot with gold, were unveiled and dedicated, one by one, with various people from the POW families, and local people, assisting the Archbishop. With the afternoon sun lighting up the three lower windows in spectacular fashion, the strains of the Hallelujah Chorus filled the church and the final curtain rose slowly, to reveal a window of such stunning and awesome magnificence that every person present, some 300 all told, stopped clapping and stood in rapt silence, absolutely transfixed. Tears poured down almost every cheek, including those of cameramen and journalists. I have never experienced anything like it. The Windows of Remembrance must surely be Philip Handel’s finest work. The following day, at 4 pm, there was an ‘official opening’ by the Deputy Chief Minister and Sabah’s Minister for Tourism, at a most joyous and moving celebration, a wonderful community event at which children danced and balloons were released. The Minister, along with representatives of the Australian and British High Commissions and other dignitaries, entered the church, where they gazed in wonderment as the The Windows were revealed one at a time, as on the previous day. However, it was not until later, at the reception attended by the VIPs and our donors, that I realised how much our windows meant to the wider community. There was total silence and a good many more tears when a tiny Chinese lady presented me with a beautiful oil-painting of Mt Kinabalu, where local legend says the spirits of the dead ascend, to express her gratitude for honouring the local people in the Windows of Remembrance. Aged 82, she had travelled by public bus with her son, as her interpreter, all the way from Kota Kinabalu – a journey of seven hours – to meet me. However, while I was the catalyst for the project, it was the support of the donors who made it possible. Their generosity turned a terrible, tragic story into something glorious and uplifting; a priceless work of art which will not only last for centuries, but will bring joy and pride to so many people.